In this article, I’ll go through how to use Priceline to book a hotel. Priceline is one of my favorite websites for booking a hotel. As long as I don’t have to be at a specific hotel, I almost always use Priceline’s Name your Own Price hotel booking feature to book my hotel rooms. Using this feature, you can save up to 50% of the quoted price of hotels. Priceline has multiple booking fronts. List view is the standard hotel booking engine where the customer can choose from a list of hotels with each of their prices clearly listed. For the purposes of this article, I will ignore this booking front. When hotels have unsold rooms, they sell them to Priceline at a significant discount. 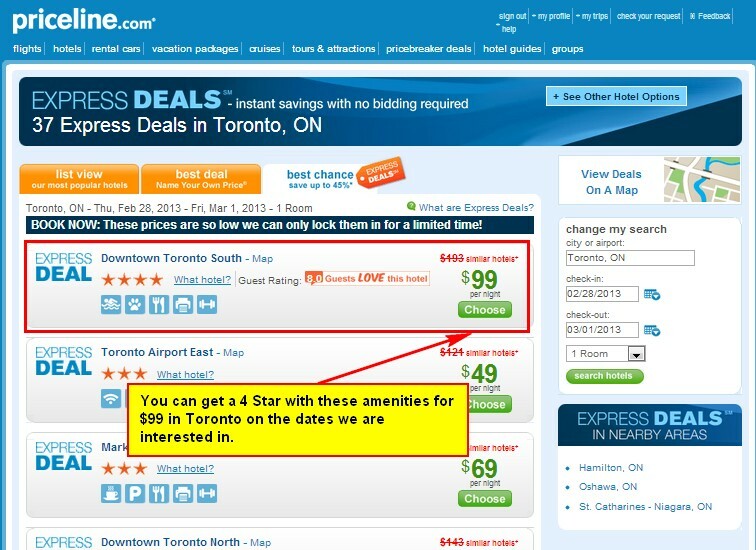 Priceline then resells those rooms to customers. They are able to do this by putting each hotel into a geographic zone and giving it a star rating. 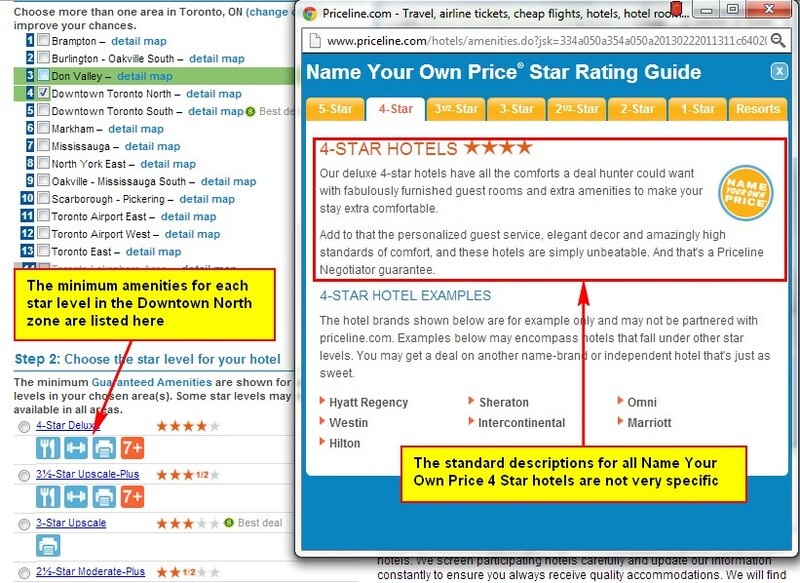 The customer then purchases a hotel room based only the geographic zone and star rating of the hotel. Once the hotel room is purchased, the customer is given the particulars on which hotel they are reserved at. All purchases are final sale and non-refundable (so that people don’t cancel if they got an unfavorable hotel). The Best Chance method works in a more similar fashion to a traditional hotel booking engine, with the limitations stated above. When you put in your city and dates, you are given a list of options, separated by neighbourhood (geographic zone) and star level. Each of those options have a particular price. In this case, you can purchase a hotel room with the given criteria for a specified price. As you can see from the screenshot, the hotels are listed clearly with the neighbourhood, star level and some of the guaranteed amenities of the hotel. In this case, we can get a 4 star hotel in Downtown Toronto South with a pool, pet friendly, restaurant, business centre and fitness centre for $99. (the cheapest 4 star from traditional search was $176). Name Your Own Price adds another layer to the concept. In this section, the customer has the option to put in a price that they are willing to pay for a hotel within certain criteria. You choose your city, dates, minimum star level, and acceptable neighbourhood(s) and put in a bid for what you would like to pay for a room. If there is a hotel available for that price, then you have a reserved hotel room. Note that you can add an acceptable zone / neighbourhood to your bid (ie bid 1= North downtown, bid 2=North downtown or South downtown) OR lower your minimum star level to get another bid. You do not need to change both. In the next article, I will show you how to use your knowledge of these rules to make sure you get the best rate for your hotel. What does a Star level or zone mean? Each metropolitan region is divided up into neighbourhoods. 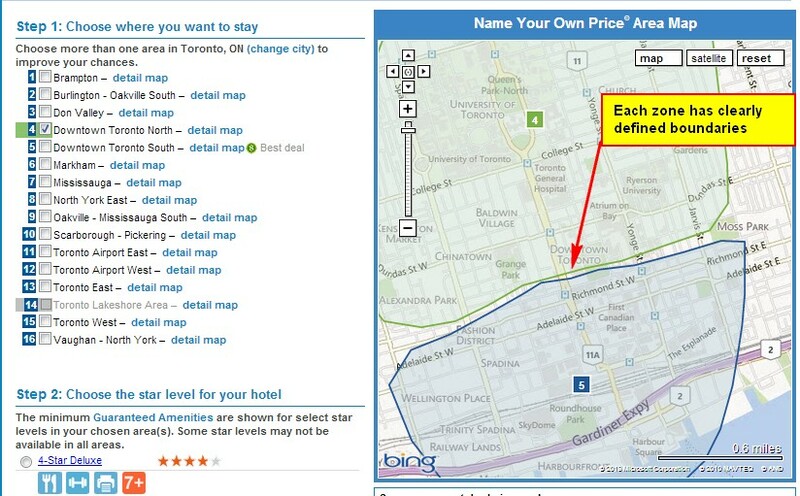 For example, these are the 16 neighbourhoods in Toronto that you can book a hotel in. The map clearly defines the boundaries of the neighbourhood. Your hotel is guaranteed to be in that geographic are that you specify as acceptable. There is also a definition for each star level. Unfortunately, this varies by region. When you select a specific neighbourhood, the listing of what the minimum amenities for each star level will be clearly noted. All rooms will accommodate up to 2 adults. Requests for bed types (King, Queen, 2 Doubles, etc.) or other special needs (including preferences for smoking or non-smoking rooms) should be requested through your confirmed hotel and cannot be guaranteed. I have never really had an issue if there were more people in the room, but it is not guaranteed. You might end up with a King bed and 4 people want to stay there. That could be awkward. You might be traveling with a friend of the opposite gender and get stuck with a single Kind bed for the 2 of you. That could be even more awkward (it also could be fun). Probably the biggest frustration that people have with Priceline is that sometimes hotels add an additional amenity fee upon arrival at the hotel. Although Priceline is not to blame for this, it is very underhanded by hotels as they basically lower their minimum bid price (to win more customers) and inflate their price using the amenity fee. These are mostly prevalent in resort areas, such as Miami Beach and Las Vegas. If you are booking a hotel in what could be considered a resort area, plan on paying an extra $15 – $30 / night in amenity fees when you check into the hotel. This is what Priceline has to say about it. Depending on the property you stay at, you may also be charged (i) certain per person, per room or percentage based mandatory hotel specific service fees, for example, resort fees (which typically apply to resort type destinations and, if applicable, may range from $10 to $40 per day), energy surcharges, newspaper delivery fees, in-room safe fees, tourism fees, or housekeeping fees and/or (ii) certain optional incidental fees, for example, parking charges, minibar charges, phone calls, room service and movie rentals, etc. These charges, if applicable, will be payable by you to the hotel directly at checkout and are not included in your offer price. Please contact the hotel directly as to whether and which charges or service fees apply. Clearly the amenity fee is counter to the purpose of Priceline’s Name Your Own Price. In my experience, I have only been exposed to the amenity fee once. I was able to get out of paying it, though. When I was checking out the hotelier informed me that I had an amenity charge that I was responsible for and when I informed him that the reservation was fully prepaid, he showed me a paper from his desk outlining the reason for the amenity charge. Clearly this was something that people have complained about in the past. I had purchased this with a gold level American Express card. When I was informed of the charge, I contacted the credit card issuer and informed them of this fraud (and yes, it is fraud) by the hotelier. They promptly made note of the charge and I was never responsible for this fee. If you do end up getting an amenity fee, it would be a wise idea to contact your card issuer and inform them that the hotel tried adding a mandatory charge on a fully prepaid booking. Hopefully they help you out if you are a good customer. One of the major caveats is that if you do have any affiliation with the hotel chain’s loyalty program, you are likely not going to get any benefits on a Priceline reservation. If you value the ability to upgrade or be treated like a frequent guest, then this is not your best solution. That being said, the only hotel chain that I have ever had any status with is Hyatt, and the only reason I had that was due to acquiring the Chase Hyatt credit card (US residents only) when I was living in the US. At one point, Priceline did happen to choose a Hyatt for me to stay at on a trip. When we arrived, I informed the desk of my status and they informed me that the status I had would give me a refund of any internet charges I might accrue during this stay. SOME hotels do give you some of your status benefits, even on Priceline stays. I wouldn’t count on it, though. On various forums, people often complain that when they check-in using a Priceline reservations, they have received the worst rooms or second tier service. I, personally, have never had this experience and have always been treated well by hotel staff. I understand that some hotels may treat customers like this to discourage Priceline bookings but I imagine that if you do get any type of subpar service, a quick call to Priceline will resolve the matter. If that doesnt work, and the hotel has committed some cardinal sins, then a call to your credit card company should resolve the matter. As mentioned before Priceline hotel rooms are non-cancelable. They are fully prepaid and no changes can be made once they are reserved. This is a major drawback to Priceline booking, especially while your plans are not finalized. For this reason, I always suggest to people to make cancelable backup reservations when you know your plans and then close to the actual dates, say 2 – 3 weeks, book your reservation through Priceline. This way you minimize the chances of being stuck with a hotel room if your plans change. There are also shopping portals that will give you a percent of your Priceline purchase back for using their link and registering with them. My favorite portals for Priceline are Ebates and TopCashBack. If you use my links to these sites, then you will receive $5 or $10 after you make your first purchase. Alternatively, if you find these are too much trouble, then using my Priceline link will earn me a commission and I do appreciate that. Priceline is a great tool for booking hotels. If you are flexible and dont mind booking a non-refundable room, you can use the Name Your Own Price feature or the Express Deals feature to book hotels based solely on area and star rating and neighbourhood. There can be huge savings if you take this route. You will want to watch out for amenity fees, which some hotels (often resorts) charge as mandatory fees after you arrive. Some people have also found that they are treated worse when they have Priceline bookings. In both cases, your credit card company MAY be able to help, so make sure to use the right credit card for the booking. I also suggest using a portal to make your booking. Ebates and TopCashBack are my favorites. Don't subscribe All Replies to my comments Notify me of followup comments via e-mail. You can also <a href='https://www.creditwalk.ca/comment-subscriptions/?srp=740&srk=2648578ecea05c83754707575dc5a494&sra=s&srsrc=f'>subscribe</a> without commenting.